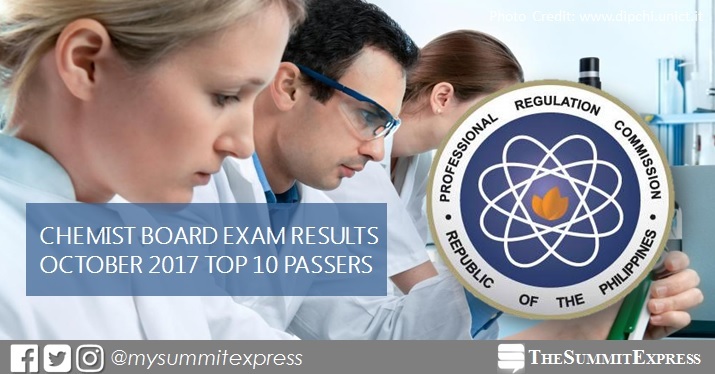 MANILA, Philippines - The full list of topnotchers or top 10 passers for October 2017 Chemist board exam is available on this page as officially released on Wednesday, October 18, 2017 or in 2 working days after the exam. Gio Ferson Maliksi Bautista from University of the Philippines - Los Baños (UPLB) topped the board with 93.00%. In the October 2016 Chemist board exam, Mikel Jason de Guzman Allas from the De La Salle University (DLSU) - Manila topped the board with 93.50%. It was followed by Jerrica Dominique Navarro Gazmen from University of the Philippines - Manila (UPM), 92.00%. Meanwhile, UPM graduate Abdul-Rashid Batara Sampaco III aced the September 2015 licensure exam with 92.25%. Ateneo de Manila University (ADMU) graduate Patrick James Borromeo Cruz and UPM alum Gabriel Luis Limpo Neri tied on second spot with 91.25%.